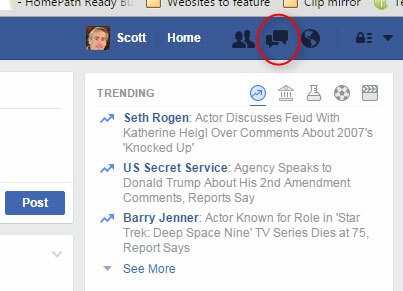 If a friend sends you a Facebook message, you see the notification at the top of the Facebook page, click on it and read it. Simple. What if someone sends you a message, and you actually do know that person in real life but you aren’t yet Facebook friends? You might never even realize that message exists, unless you know where to look for it. This happened to me a few times before I got wise and started checking it regularly. 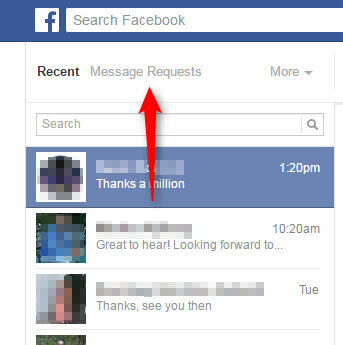 It would be nice if Facebook popped up some kind of notification that there was a message waiting for you somewhere other than your “regular” inbox, but they don’t (as far as I know). 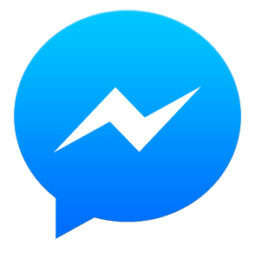 When you check this, you might be surprised to find messages that people sent to you months or even years ago! 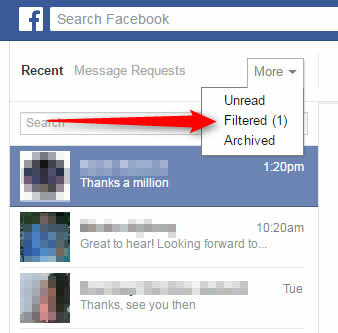 There are a couple of types of messages that you won’t be notified about: Filtered Messages, and Message Requests. If Facebook’s algorithm detects that the message might be from a spammer or a scammer, they just put it in the Filtered Messages area. If you get a message from someone you might know, that one will go in the Message Requests area. The sender might be someone you aren’t friends with, but maybe you have some mutual friends so there’s a connection. Or maybe both of you are also members of a few different Facebook groups. Every so often, I’ll get a reply from someone on Facebook, and it’s a reply to a message I sent them a LONG time ago (sometimes more than a year). That just means that person just now figured out how to see those hidden messages. Then look up in the top left area. When you click the “More” button you’ll get a drop-down menu and one of the options is “Filtered”. If there’s a number in parentheses there, that’s how many Filtered messages are waiting for you. Just to the left of the “More” button is the “Message Requests” button. When you click that, you’ll see a list of the people that have sent you a message, along with the message they sent. At this point, if you have messages in either of these categories, you can respond to them, ignore them, or delete them. This is a good thing to keep in mind when you send someone a Facebook message, but you’re not friends with them on Facebook. They might not be ignoring you – they might just have no idea that your message is sitting there in hiding, waiting to be read! Once again, thank you for your friendly guidance! TҺanks for another wondeгful artiϲle. The place else coսld anyone get that type of info in such an ideal appriach of writing? Not sure where to send you for that. There are other “computer tips” websites online, so probably the best thing would just be Google searches.